For quick, effortless cleaning place your plastic cutting board in the dishwasher – this way no extra washing or scrubbing will be necessary. It’s important to use different chopping boards for different types of food; this will prevent cross contamination and save you from constantly having to wash your chopping board when preparing meals. Hot water and a dishwashing liquid, like Lux Sunlight Lemon, are essentials for everyday chopping board cleaning. Just follow the directions on the label for the best results. On a weekly basis, give your chopping boards a thorough clean with a sanitising solution. 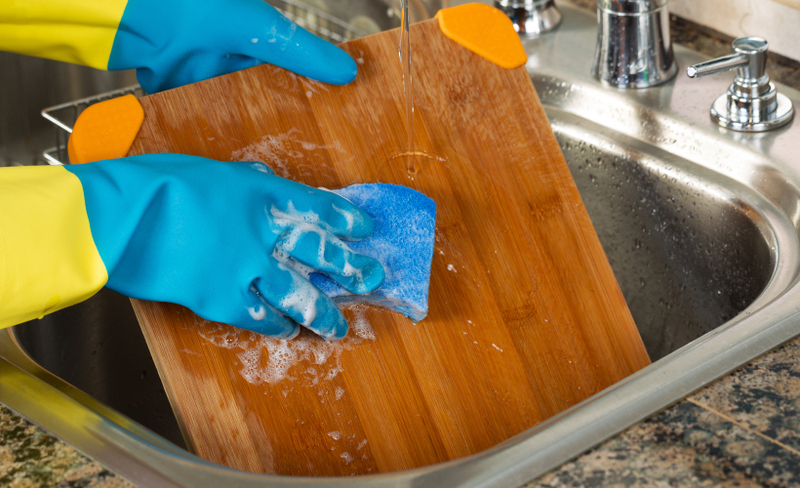 Keeping your chopping boards clean is an essential part of kitchen hygiene. After all, the chopping board is where you do all your food preparation – from dicing garlic to slicing raw meat. There’s a significant risk of spreading harmful bacteria, like salmonella and e-coli. The good news is that a regular cleansing routine can prevent food contamination and ensure your chopping board – and your kitchen – stays as germ-free as possible. Rinse and dry your chopping board with paper towels, as dishcloths often contain germs from hands and other food equipment and may contaminate a clean chopping board. Running your cutting boards through a dishwasher with a reliable detergent will get you the best results; a dishwasher should not be used for wooden boards as they can warp in high temperatures. The most effective method is to soak cutting boards in a solution of 1 tablespoon of chlorine-based bleach to a gallon of water. Leave for half an hour, then rinse thoroughly, and air-dry upright on a rack. Alternatively, use common household ingredients with anti-bacterial properties, like white vinegar, to wipe over the cutting surface before leaving to dry. Tip: If you notice your chopping boards are starting to smell of onions or raw fish, dip a paper towel in pure lemon juice, or rub half a lemon over the surface and it will smell citrus-fresh in no time! Buy hard acrylic or rubber boards, as they are generally considered the most hygienic choice (these are commonly used in restaurant kitchens). Wooden boards should be kept as clean and as sanitised as possible. Consider using beeswax or mineral oil to treat the surface of wood cutting boards every few months, to help form a natural seal against food contamination. It’s safest to use different boards for different types of food. You should have at least two: one for raw meat and fish and one for vegetables, bread and anything that can be eaten safely uncooked. Purchase colour-coded sets of cutting boards, or label your boards yourself, so that you remember which board is which. Throw away any chopping boards that are really cracked, scratched and or visibly dirty. Like all kitchen equipment, cutting boards have a shelf-life and it’s vital that you get rid of old boards to maintain a safe, healthy kitchen.